Resolute was a yacht designed and built by Nathanael Greene Herreshoff for a syndicate of New York Yacht Club members headed by Henry Walters to contend the 1914 America's Cup. The mast of the Resolute currently resides at Camp Resolute, a Boy Scout camp located in Bolton,MA. 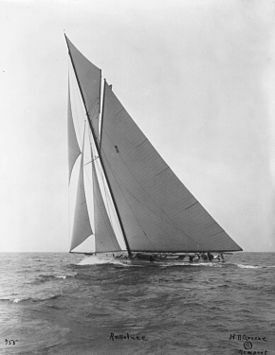 Resolute was the last Cup defender to be designed by Herreshoff. Resolute was christened by Grace Vanderbilt and launched on April 25, 1914. In the 1914 America's Cup defender selection trials, skippered by Charles Francis Adams III, she beat Vanitie and Defiance. In so doing, she beat the America's Cup course record off Sandy Hook by sailing 30 miles in 3:16:41. However, the outbreak of World War I caused the America's Cup races for 1914 to be postponed. 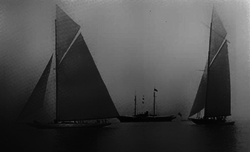 The race was finally held during the 1920 America's Cup. Resolute leading Vanitie at start of first elimination race off New Haven 1920. In 1920 the America's Cup was reconvened and Resolute again prevailed in selection races before successfully defending the Cup in July, once more with Adams at the helm. Resolute lost the first two matches before recovering to defend the cup 3-2 against Shamrock IV. Robert Wales Emmons, Jr. was the manager of the yacht in 1920. In 1925 Resolute was sold to E. Walter Clark of Philadelphia. Her racing career lasted another ten years, and in 1930 Resolute again participated in the America's cup selection races, albeit as a "trial horse" against which the potential defenders could be judged. Robert F Kennedy named his Wianno Senior Resolute in 1964, after the America's Cup yacht. ^ "Challenger and Defenders of the America's Cup". Scientific American: 622–623. June 5, 1920. ^ a b c d e f "Resolute". Americas Cup. Archived from the original on 2012-03-31. ^ "Resolute Beats All Cup Course Records". New York Times. June 11, 1914. Retrieved 2010-10-15. ^ "Robert Emmons 2d, Yachtsman, is Dead". New York Times. April 19, 1928. Retrieved 2011-04-26. ^ "E.W. CLARK, BANKER AND YACHTSMAN, 88; Head of Philadelphia Firm Dies --Owned Resolute After It Defended America's Cup". The New York Times. April 5, 1946. Retrieved 27 January 2012. Wikimedia Commons has media related to Resolute (ship, 1914). The International Yacht Race Technical article, Marine Engineering, July 1920 by C. A. McAllister including photos.